There have been so many new releases this month from some of my favourite brands including Marc Jacobs, Real Techniques, Kiehls, 3ina, Press Play and SO SO many more! Let’s start off with the Kiehls Midnight Recovery Concentrate. The replenishing nighttime facial oil is packed with distilled botanicals that restores the skin by morning. The oil works with the skins natural nocturnal activity to regenerate, restore and replenish the skin. The oil is 99.8% natural and paraben free which makes it even better! Are you forever losing your hair ties and bobby pins? Well don’t you worry, The Hair Connection has you covered. This all new subscription drops hair ties and bobby pins at your door once a month so you literally NEVER run out – how bloody fantastic?! You all know how amazing Marc Jacobs is and the iconic Daisy perfume has been around since 2007 and the phenomenal scent has been released in many different versions, but the latest is my favourite! There are three scents in the latest Twinkle range, but these two are my favourite. The blend of lavish florals, juicy fruits, fresh cherries, hit flowers that evoke the scent of springtime. 3ina is SUCH an amazing brand and the new Lip Vinyls are absolutely beautiful. The Lip Vinyl provide a smooth, glide on vinyl shine with a cushion application and non-stick formula. The Lip Primer is one of my favourites and the water based primer gives you a longer lasting lipstick base and smoother lips all in one. I have a major brush crush on Real Techniques latest brushes. The glittering handles and beautiful bristles make me almost not want to use them, but with densely packed, soft bristles will make them a VERY fast favourite in my makeup bag. Now onto one of the products I am most excited about – the Press Play capsule. If you’re a beauty lover like me your bag is probably FULL of makeup, but how annoying (and heavy) is it lugging around half a bloody makeup bag half the time? Well, Press Play have you covered. This clever little capsule houses seven liquid beauty or skincare products as well as one powder cosmetic. My capsule houses a beautiful mascara and hand sanitiser (not swatched here) as well as a black liquid liner, brown brow pen, two liquid lipsticks (that double as eye shadow and bronzer) as well as a gorgeous powder highlighter. I could not love this more so expect plenty more of this on the feed. Palm Beach‘s new Vintage Gardenia body bar and candle smell amazing and leave me feeling like I have been hugged by a blooming flower in the middle of Spring. The range also features a beautiful hand and body soap as well as a reed diffuser. How amazing are these primers from LUMA?! I am seriously obsessed. The Natural Radiance Bronzing Primer is perfect for when I need a bit of colour in my face and the Liquid Light Illuminating Primer is amazing for when my skin is looking a bit dull. Both can be worn alone or under makeup. How beautiful are both these Daniel Wellington watches? They’re the perfect accessory to add some chic style to any outfit! 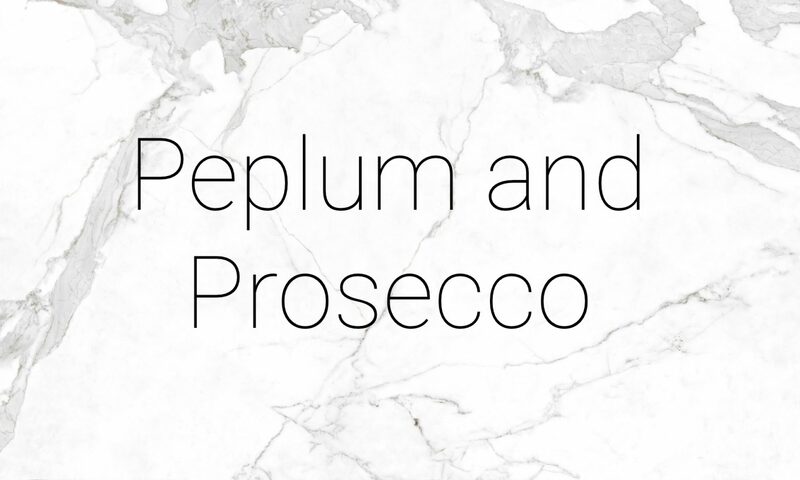 Use the code ‘peplumandprosecco’ for 15% off AND a free strap (not a commission code). I am also loving Essano’s new Certified Organic Radiance Facial Oil. The brand has been a long time favourite of mine as you all know and this newest edition is just as beautiful as everything else they create. The oil is packed with essential antioxidants and vitamins to improve skin tone, texture and firmness as well as brightness, brown spots and environmental damage. Finally, this months amazing Bellabox. This box is packed with goodies from Neutrogena, Blaq, Elastoplast, Nyx, Pixi and Akin. The Neutrogena facial wipes are a firm favourite of mine as they gently remove makeup without irritating the skin. I can’t wait to try the Blaq masks and Akin creams. The Petra by Pixi lip balm is absolutely beautiful! Unfortunately my Nyx palette came smashed, but I will sort it out and let you know what I think! I hope you enjoyed reading this with your cup of tea and having some time to yourself. Let me know if you try any of these products and how your go with them!